Not much summer left and this one was a doozy. Some things we planned didn’t happen and a bunch of things we wished would never happen did anyway. We were on island for a bunch of weeks in a row. Mornings were spent with Pippi and Gracie at the doggie beach and the joy I felt watching Gracie run ahead and wait for us at the top of the dunes is something I will remember always. Then Eli got sick. Sick for real. There were lots of scares and tests before the Lyme’s and Babasiosis were diagnosed. There was some hospital and hotel with AC for the worst of the fevers and a long recuperation. But along the way we read an Al Capone novel together, drank buckets of iced chai and discovered a spy show that brought us hours of fun in bed and pretty soon back on the porch of that hotel. He’s fourteen. More out on his own in a pack of kids on bikes and at movies than spending time with us. So this little interlude will hold us in good stead for the teenage stuff that is surely coming. Scary. Didn’t want it, but made the best of it. And then Gracie got sick. The timing just after Eli seemed unlikely to be a coincidence. But it was. She died in just three weeks of a virulent juvenile Lymphoma. Gracie Goo and Pippi too had been our refrain. Now we take Pippi everywhere to keep her busy and to distract us from the fast sadness that swept through here. Stuart is fifteen. We’d figured he would be next after Eloise. No one could have predicted this pain. It was so wrong. Horrible. And yet there were those sweet weeks on the doggie beach. She’d loved the Vineyard as a puppy and got to love it one more time. She and John were close in the special way we get with animals every once in a while. We choose them and then they choose us and she and John were a pair. The bond between humans and their animals is ancient and profound and to lose it suddenly like this was a deep cut. This family had already had a rough spring. In June with our college girl working on island, our oldest son working at his first job and getting ready to move out, and a new client on the Vineyard the island became neutral territory for us this summer. It was a space where we could come back together across the divide of hurt and trouble we’d shared last spring. We watched fireworks all together with champagne and crab in July and the awkwardness began to shift over to make room for the new memories we were making together. Then Eli got sick and everyone pulled in the same direction for him and then Gracie and so just like always this family came together with love and tenderness. This past weekend we had a house full of friends family and a big summer BBQ. 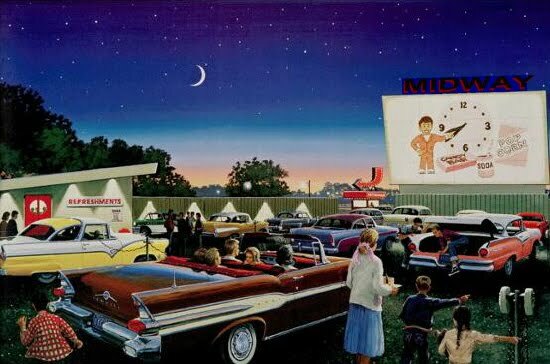 This was to be our annual drive-in party where we hang a king sized white sheet on the side of the house and watch an old silly summer blockbuster with a concession stand of Dots and Snow Caps on the porch. This year in honor of our island summer it was going to be Jaws. The whole thing was planned before we lost Gracie, but of course we went ahead. You don’t celebrate a life by stopping yours. Friends from NY and the island filled the bedrooms and by nine o’clock on Saturday night the yard was a picture of quilts and lawn chairs and you could hear the classic sound of the shark music way down in the village. It was a grand celebration with the people we love and who love us back. We had moped and been sad, and we will undoubtedly do more of that. But the breeder told us that Graice had been guaranteed for three years and so here was a list of breeders from whom we could choose a puppy whenever we were ready. We’d spent months looking for this one with her Swiss lines and lovely genetic history of good health. Should we try again? Could we? Eloise had been the dog of my heart and she’d had a full and happy life with us. Now Gracie had barely gotten out of her puppyhood, but she and John formed a bond that he will cherish always and we all so loved her rascally sense of humor and those happy treks on the doggie beach. Berners are so smart, so soulful. None of us can imagine life without one it turns out. And so we have begun looking at cute puppies all over again. There is a breeder in Canada with all European lines who lives with eight, yes eight Berners in her house. We will go visit and maybe in October…. I think you have to step in front of the fear to get to the joy. This summer had doggie beaches and a ride on a carousel. It had a scary sick kid and a couple of clients who weren’t paying me but who still say they will in September. They better or there will be lots more to worry about. There were movies in bed and a drive-in in our yard. There were breathtaking sunsets and a couple of days on a beach with my husband that I know I will still be thinking about when I turn 80. There was a kid who moved out and another one who found a summer love. There were sweet sugary peaches with juice running down my chin and googobs of tomatoes. There were friends I missed when I was away and for whom I will always be grateful when I am here. We lost Gracie. We had her and we lost her. We loved her big and hard and we are losing her the same way. But the thing is we did get to have her. So this was not a perfect summer. Far from it. It was not the one I planned. But it was the one I got. But look winter will be here a long time. And meanwhile there are still two weeks left of this summer. If we hurry I’ll bet we can probably get up to a little more…. I notice you din't write much when you were in the middle of it and like always you have found a kindly way through. I'm sorry I never got to meet Gracie, but she couldn't have gotten a better family for an intensely happy short life. The new puppy will be equally as lucky. I'll never forget that Pippi rescued me from the attack of the killer chicken, and that Stuart was so adept at turning his back to me every time he saw me lift my camera! New puppies are exciting! Fortunately they keep us busy enough that little time for thinking is left-over. Summer is winding down but I think these last few weeks of summer are always my favorite. I have to say, I'm a fan of September too! Good things to come. I think you have to step in front of the fear to get to the joy.” i need to do that, too. moving has been really hard, and hard to write about, as now too many people read my blog to be totally honest there, including my husband and his sister, and possibly his parents. I'm not angry with him about the move, but am feeling incredibly sad, and he seems to be taking that super personally, which doesn't help me to feel any better, it only adds guilt to the sadness. and so we are not off to the best of starts. I finally sat at my computer today and I couldn't wait to come over! Your beautiful way of seeing things and remembering what is important is so lovely to me. I am glad that your boy is on the mend, and I am so sorry about Gracie. Oh Ellen. My heart … You know it has a special place for beloved pets. Hugs. You face these things with such grace but it still makes me sad. Soulful is you! Glad Eli is better and the gathering sounds fabulous! Thanks for catching us up. So, so sorry about Gracie. The family is healing, tho. Doesn't take the pain away from the loss, but that's hope in a fragile moment.